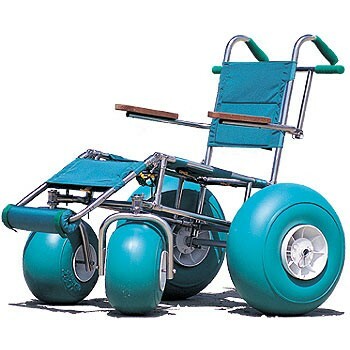 With its patented low-pressure pneumatic wheels made of soft PVC, the Landeez glides over terrain--including sand--that would be impossible for regular wheelchairs! Omni-directional front wheels rotate 360 degrees, allowing users to maneuver in tight spaces. Frame disassembles in seconds for easy transport and storage. Features a removable leg rest, swivel and left armrests for easy transfers, and washable fabric. Weight capacity: 425 lbs. Wt. 37 lbs. Frame Components and Fittings: 5-YEAR WARRANTY. Gray tires: 2-YEAR WARRANTY. Teal.